We are excited about the upcoming Paoli Shop and Hop! Several of our tenants are participating in this festive spring event. Saturday, April 8, Paoli will be alive and buzzing with fun events for the whole family. Event-goers will have the chance to win basket raffles, scavenge for hidden eggs, meet the Easter Bunny, and enjoy refreshments. All proceeds will benefit the Paoli Fire Company. 11 AM-6 PM: Shop at participating stores to receive raffle basket tickets. Participating shops include Paoli locations for: Polka Dots, Studio H Color & Design Group, Home Cooked, Orange Theory, Platos Closet, Primo Hoagies, Progressive Chiropractic, Pure Energy, Starbucks, TJ’s Restaurant & Drinkery, Tropical Smoothie, and more. 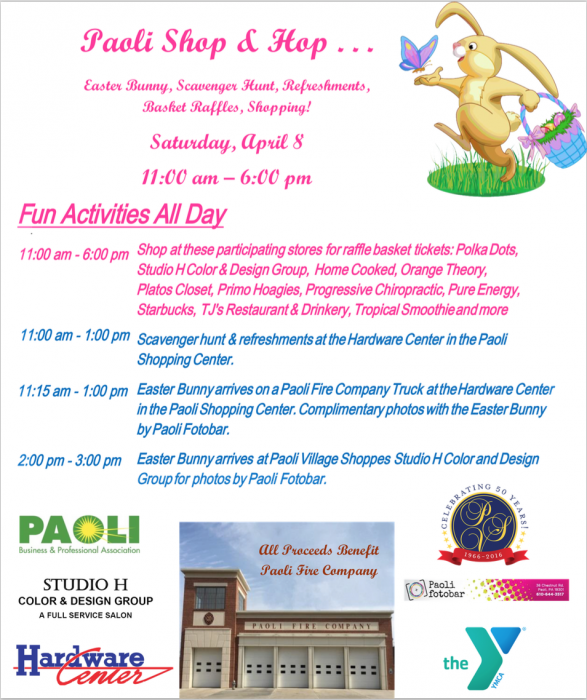 11 AM-1 PM: Head to the Hardware Center at the Paoli Shopping Center for a scavenger hunt. Refreshments will be served. 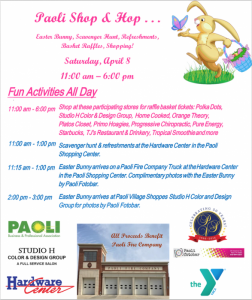 11:15 PM-1 PM: Meet the Easter Bunny, who will be arriving by Fire Truck at the Hardware Center in the Paoli Shopping Center. Paoli Fotobar will provide complimentary portraits. 2 PM-3 PM: The Easter Bunny makes his next stop at Studio H Color and Design Group. Stop by and get your complimentary photo! We hope to see all of our customers at this fun event. Special thanks to our participating tenants.